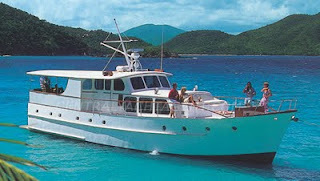 1956 de Vries FedShip, Flame offering yacht charter special. We are running a special on FLAME for January and February 2010: all charters of a minimum of 4 nights will receive one night free! Flame is a 1956 de Vries FedShip. In 1995 she was lovingly restored, retaining the old world charm while providing modern conveniences in a layout specifically designed for charter. The elegant air-conditioned main salon boasts a full entertainment center complete with 26 inch color TV, VCR, six CD changer, and cassette player. Flame has an extensive music collection and VCR library over 300 films. Enjoy outdoor dining on the 28ft x 15ft covered aft deck. Click here for more photos and information on charter rates and availability.